It is the present and future goal of the Shermans Dale Community Fire Company to continue the legacy of service to others that was started by many respectable members of our community years ago. Members are committed to increasing their fire services knowledge through training and educational courses; they place value in presenting themselves as positive role models in order to continue a trusted relationship with our citizens; and they are dedicated to conducting fundraising events which help raise needed monies to offset tax increases to our citizens. It is with continued community support and volunteerism that the Shermans Dale Volunteer Fire Company will continue to excel in our community. Next Raffle will be on April 18th. Meal will be announced closer to the Event Stay Tuned. SATURDAY NIGHT BINGO APRIL 6TH, 13TH, 20TH, AND 27TH. 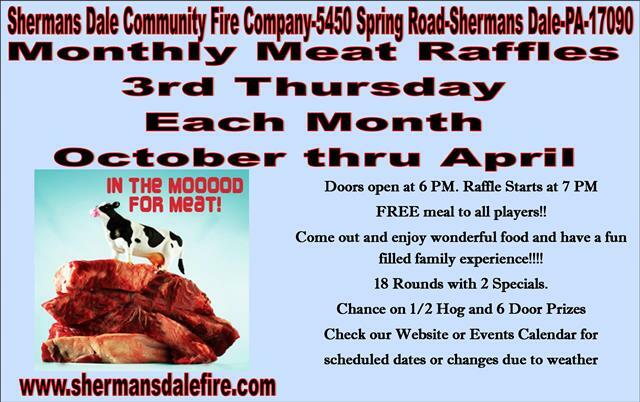 See our Events Page for More details on Saturday Night Bingo at Shermans Dale Community Fire Company. See our Events Page for more Information on these and other events. Below is a list of calls that we have recently run. For more Information on our Statistics Check out the Statistics Page.